Hail is kind of weird if you think about it. Chunks of frozen rain fall from the sky, and often wreak havoc on our lives. These strange storms do a lot of damage. In fact, around $1.6 billion is spent on hail damage annually, according to the Federal Alliance of Safe Homes. While you’re cozied up inside protecting yourself from the storm, your roof is taking a beating to provide you with shelter. 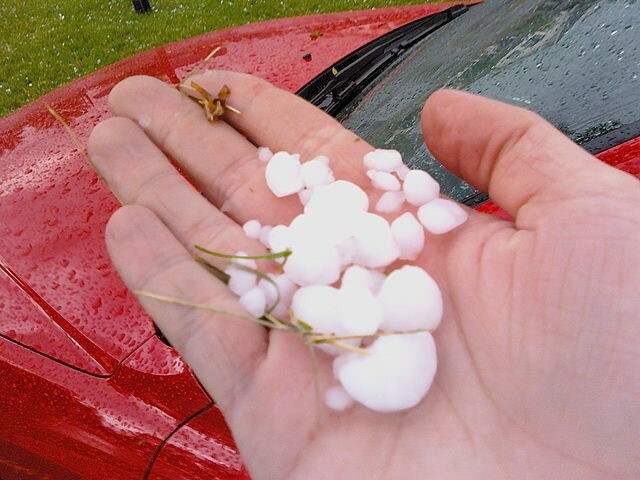 As we’ve seen, the problems caused by hail storm can be extremely expensive to repair. For homeowners, the average cost of repairing hail and storm damage is $5,757. That’s not exactly pocket change. Unfortunately, you won’t notice the worst of it with a cursory glance; it requires a more careful examination. After a hail storm, it’s prime time to inspect your roof for damage. Use our handy checklist to begin your own inspection. Start by checking your yard for debris and loose shingles. Next, go to the gutters, inspecting for leftover hail and pocked marks on the metal. The more hail you see piled up, the worse off you may be. Confirm your suspicions by heading to the roof (safely, please). You’ll want to check the size of dings left in the metal and roofing. Soft metal is usually the easiest place to start looking for evidence. Hail sized at 1.25 inches in diameter is enough to mess up your shingles. But even small bits of hail can erode your roof, especially if it is composite and older. Keep an eye out for dings and marks as well as missing shingles caused by high winds. You may find bits of asphalt worn away. To be on the safe side, feel for small dents and dings that may be hard to detect through sight only. The damaged caused by hail affects your house internally, which of course, tends to be the most expensive and time-consuming to repair. It also may leave you looking for an alternate place to stay while repairs take place. While you might not be seeing any noticeable effects on the outside, you’ll want to keep a running list of any inside problems you notice regardless. Time of the essence when it comes to filing an insurance claim. If you file too late, you may miss the opportunity. You’ll need a professional inspector to help you find the precise evidence. Hail damage tends to be sneaky and you may not notice the problems until they become a big issue. A professional inspector can look beyond missing shingles and pock marks to find the actual core damage to the roof. Choosing a good one can save you big bucks on repairs for leaks and the like later on. Even damage that may not be a problem now needs to be documented in case things go south in the future. Juneau Odenwald Roofing performs inspections with the goal of stopping minor problems before they worsen. When it comes time to repair your roof, you’ll want someone who can get the job done quickly but conscientiously. Our team is prepared to solve your problems and perform on-going maintenance. For your inspection, repair and maintenance needs, reach out to the experts at Juneau Odenwald Roofing.